There is no second children in the streets doesn't cry for NNAMDI KANU. There is no hour his name is never on the lips of the adults in offices or at home. He is now as ever the latest sensation in the political discussions across AFRICA. The world wonders who he is, of what build is he made and look forward to his second coming. Those who plotted his assassination, in jaw dropping awe, cries HAD WE KNOWN. Since the military killed him or took him after invasion and destruction of his home, Nigeria has never known peace. In the National Assembly, among political parties, in the armed forces, in social, economic and religious circles, the worst is falling on Nigeria like rain. He warned humanity of the impending doom should Nigeria continue to hold BIAFRA. He pleaded with the clergy to call on their God and suggested imperative measures to check-mate the on going JIHAD across Nigeria. He spotted the monkey pox, a biological weapon employed to reduce BIAFRA population. Wherever he is now, dead or alive, I want to let him know that TY DANJUMA, David Mark, Abubakar Tsav and Paul Unongo has gone the way of Ohaneze, crying when the head is off. Nobody can curtail the killings going on presently in the Middle Belt. Homes are destroyed, churches burnt down to ruins and Rev Fathers and Sisters ministering in the altar defiled and massacred in cold blood. This may be the fulfilment of your pronouncements that "in the end Somalia will be paradise compared to Nigeria" and BIAFRA will come. 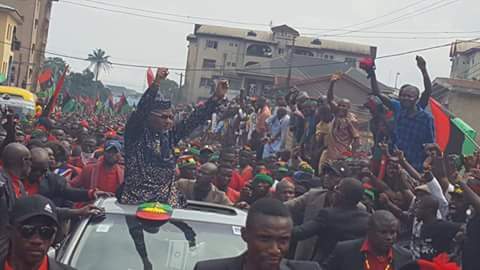 Please come back our LEADER MAZI NNAMDI KANU, come quickly our pride of Biafra. Your children are crying and praying for you.